Hi, I've come to FreeCommander XE from Powerdesk 6, but I can't seem to get tree view to look like it did in Powerdesk, i.e. at the moment I only have one tree view, and it changes depending which pane I have selected, which to me is HIGHLY unintuitive. 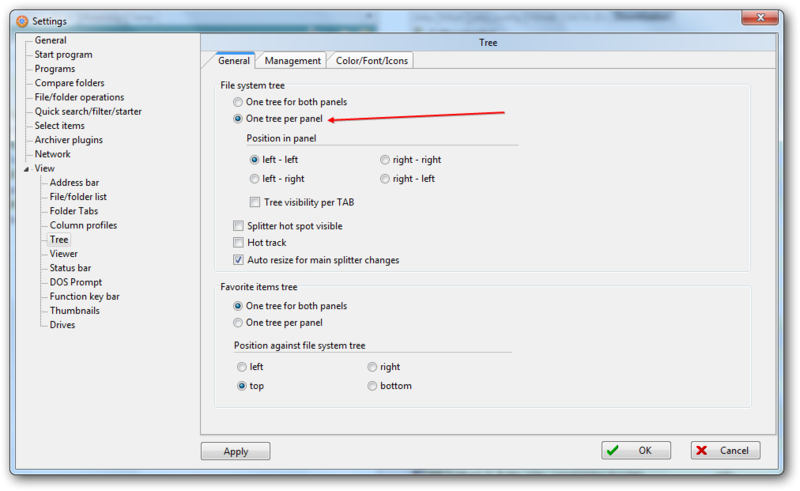 Is there no way to just have one tree view for each pane that's open, like Powerdesk does? Sorry if this has already been answered elsewhere, I did try to search. Thank you SO much, Joby, that's just what I wanted. Now I can stop using Powerdesk completely. Which forum should I have posted in? Can the mods. move this thread to the correct one, in case it helps somebody else? Sorry about that. FreeCommander XE is absolutely fantastic, I'm just about to donate now. This is the forum for FC2009. I was tempted to say it's not possible, then I saw you were talking about XE; but no problem, glad you got it working now.